Same Day Courier MD, VA, and DC, including (Rockville MD) . Welcome to Green Delivery Service, Inc., specialists in on-demand rush and same day courier services in Maryland, Virginia, Baltimore and Washington D.C. areas. Green Delivery Service can reduce your shipping expenses, while at the same time providing faster delivery with far less handling than national overnight couriers. The catch is that we only service a relatively small geographic area. 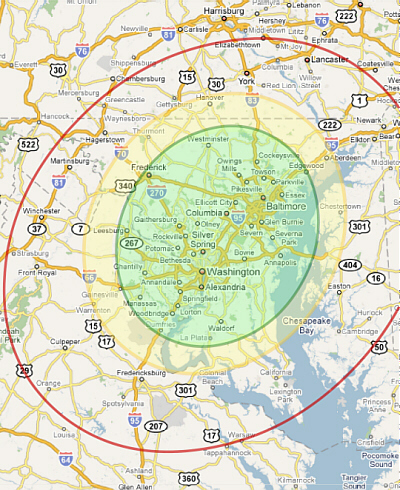 You have likely found this page because your location (Rockville MD) appears to be inside our "prime" service area (please confirm on map below). If this is correct, you can experience both the fastest service times and the best pricing available. Save money on courier delivery and get it there faster at the same time. Same-Day Courier vs. national overnight express shipping, for local area deliveries. Here is an example of the cost savings of sending a 40 lb box via Green Delivery Service same day courier vs overnight courier. The courier rate comparison table in the previous example demonstrated that the as the weight your shipment increases, you save even more money and same-day delivery costs even less than standard and 3-day ground once you reach a certain weight. This is just one example, but similar savings apply to all destination addresses within the Green Delivery Service primary service (refer to the map below). You will generally save money with Green Same-Day everywhere within the green zone. In the yellow zone, delivery prices for a 40lb box are approximately the same but with same-day you still have the advantage of faster delivery and fewer people handling your packages. Inside the red line, your rate might be less for overnight on the 40lb box, but you still save money with Green Same-Day on shipments weighing over 40 lbs. Green vs other same-day couriers Maryland, Washington, and Virginia. Copyright © 2008 - 2010 Green Delivery Service, Inc., (Rockville MD) All Rights Reserved.